Whether learning to play a complex concerto or deciding how to spend money, humans use the same frameworks to solve problems, a recent study from the Journal of Music Teacher Education shows. The five components Roesler noted—establishing goals, evaluating performance, conceiving and considering options, generalizing and applying principles, and deciding and acting—were then compared to independent studies of problem-solving components in other areas, from the way infants learn to eat to how diabetic patients respond to a glucose monitor. The results were very similar, suggesting that problem solving is a universal human trait and that people use the same processes no matter what the problem is. Roesler suggests that training teachers on these five components and guiding them through each one can improve classroom instruction and student learning. For example, she says, "One teacher may be excellent at evaluating but lack the knowledge of principles and options that lead to successful decision-making." But if trained on each component, teachers can get better at identifying problems and providing sound advice to solve them. "Toward Solving the Problem of Problem Solving: An Analysis Framework" is available. Each day, we solve a range of problems—from remembering our email passwords to deciding what makes us happiest. Can you articulate the processes behind these problem-solving skills—and can you relay those processes to your students? Khan Academy's cognition series features a five-minute video titled "Problem Solving" that showcases different types of problems we face and common approaches to solving them. Featuring hand-drawn sketch animation, the video takes viewers through complex workings of the brain with an easy-to-follow narration. Find this video and others in the cognition series here. The Teacher's Guild has a lofty but admirable goal: to "bring teachers together to solve 30 of the biggest challenges in education today." This online community, which is run by a team of educators and designers from IDEO's Design for Learning Studio and New York's Riverdale Country School, offers a free toolkit on how to implement design thinking in the classroom, as well as a robust online space where teachers collaborate on major issues, such as personalizing learning and redesigning parent-teacher conferences. For each challenge, teachers submit their best ideas and inspirations, and the community offers feedback to refine those ideas. To join the collaborations, visit the website. In July 2017, an all-girls team from Afghanistan was one of 163 teams from around the world to take part in a robotics competition in Washington, D.C., known as the FIRST Global Challenge. When my son was around six, he had a really bleak experience at school. He came home upset one day because his teacher had put a big red line across his homework and he didn't know why. Apparently, he had failed to memorize and write an essay verbatim as instructed. I decided we needed a different approach to education. So I took him out of school, and my journey to setting up the Riverside began. My background as a designer served me well. The mindset of a designer is that we are not helpless and we can drive change. Design thinking is an important part of your instructional approach. Why is it so central? Unlike other approaches in education where the focus has been so much on the "What" and the "How," I believe that design thinking puts the "Who" and the "Why" front and center. So learning based on design thinking becomes an intentional act—both for teachers and students. Student learning is not left to chance. And students themselves learn to work through problems in a way that is deliberate and empathetic, always keeping the user at the center. Design for Change evolved from a national challenge I initiated for school children to change some aspect of their communities. The challenge spurred students to solve real-life problems in their immediate environment, while building a sense of empathy, confidence, and responsibility. The idea developed into a curriculum that is now offered in schools in more than 50 countries. It's based on a simple design thinking toolset of Feel, Imagine, Do, and Share (FIDS for Kids). This process gives students an opportunity to become aware of the world around them, believe that they play a role in shaping the world, and then take an action toward a more desirable and sustainable future. By reports, Riverside's students perform very well on standardized academic assessments. Why do you think that's so? Do you have any advice to offer other educators on improving student learning? One insight I'd share is to try to keep faith in the idea of "It is possible." At Riverside, a question we constantly ask ourselves and that every educator should ask is, "If it is possible, then why are we not doing it?" and, "If we can do it, why are we not doing it today?" Of students enrolled in AP Computer Science A, 19% are female and 81% are male. Source: National Science Board. (2016). Science and Engineering Indicators 2016. Arlington, VA: National Science Foundation. 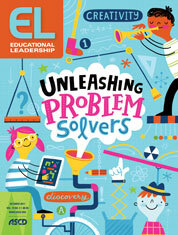 How can educators effectively integrate authentic problem solving into the classroom? How can problem-solving projects be used to build on, rather than skirt, content knowledge? What shifts in practice and expectations do teachers need to make? Explore these and other essential questions from this issue in our EL Study Guide, designed for use in professional learning communities or personal reflection. Call them sticky problems, Gordian knots, or just unsolvable, the hardest problems are those for which a detailed manual or step-by-step problem-solving method doesn't help. Think of the leak no plumber can diagnose or the blueprint an architect just can't get right using AutoCAD—or even why two countries won't stop warring. Industrial engineer Nat Greene details nine behaviors great problem solvers use for such "impossible" challenges. Although many of his anecdotes involve technical problems (like a loose bolt that makes a machine freeze up), these practices could work with any academic or life challenge. Conventional problem-solving approaches fail with "impossible" problems, Greene says, because they rely on guessing what's causing the glitch, then trying many responses until one works. Much better is "smelling the problem"—looking closely at the symptoms and rigorously identifying what's going wrong before you start acting. Vague problem statements (like "the toilet is leaky") don't help a problem solver know where to start. Precise statements ("The toilet is leaking water from this area") do. To avoid frustration and idle time, educators might do well to introduce students to these practices for complex problem solving.